Who doesn't enjoy a "crunch in the mouth"? That's what Croquembouche translates to in English. Another name for this tower of cream-filled puffs covered in caramel and spun sugar is Piece Montee (mounted piece), and in France it's served as a wedding, anniversary or baptism cake. They can be several feet high, or in the case of my little trio - 6 inches each. Most of the time, when I've seen these towers of pastry in the United States, it has been during the holidays. Perhaps because the shape resembles a Christmas tree? Or because, like a Gingerbread House, it's an undertaking to gather all the parts of this and a great crowd-pleaser to present. 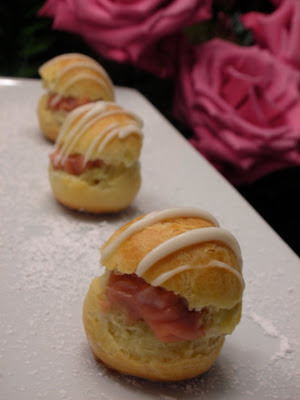 In my catering gigs, I've made several Croquembouche and I've made the puff pastry balls (Profiteroles) numerous times with different fillings. Along with her stylish online business, Gail presents unique, educational and contemporary Tea workshops at some of the best events and hotels in the US and beyond. If you ever have a chance to take part in one of her Teas or the opportunity to invite her to yours, DO! There are three main parts to the Piece Montee: Pate a Choux (pastry puffs), Cream Filling (ie. pastry cream, mascarpone, or thickened and flavored whipping cream), and the Caramel sauce (used to keep the mounted pieces...well...mounted, and to make the spun sugar threads). 1- Mix 1/4 cup milk with the cornstarch and 1 Tbls. of Matcha Powder. 3- When the milk just begins to form bubbles around the edges, remove the pan from the heat. 4- In the bowl with the cornstarch mixture, add the egg and the egg yolks, whisk til smooth. 5- Pour just a bit of the warm milk into the egg mixture and whisk constantly so the eggs do not cook. 6- Then pour the egg mixture into the pan with the rest of the warm milk and return to Med/High heat. 7- Now, using a spatula, or wooden spoon - stir constantly until the mixture is thick and begins to boil. 8- Remove from heat and beat in the vanilla and butter til smooth. 9- Place in a ceramic dish, cover with plastic wrap that you press onto the pastry cream. Chill in the refrigerator for at least 6 hours or up to 2 days. In a saucepan, bring all three ingredients to a slow simmer while stirring over Med. heat. Using a pastry brush dipped in water, wash down the inside of the pan on occasion to avoid having the sugar crystallize. When a boil is reached, stop stirring and allow to boil for about 5 minutes or until a slight caramel color appears. Remove from heat and stir while sugar cools. Using the filled cream puffs, carefully dip each one into the caramelized sugar as you build your tower. Start with the round base and gradually move to the next layer, using less puffs as you go and moving inward to a cone shape. 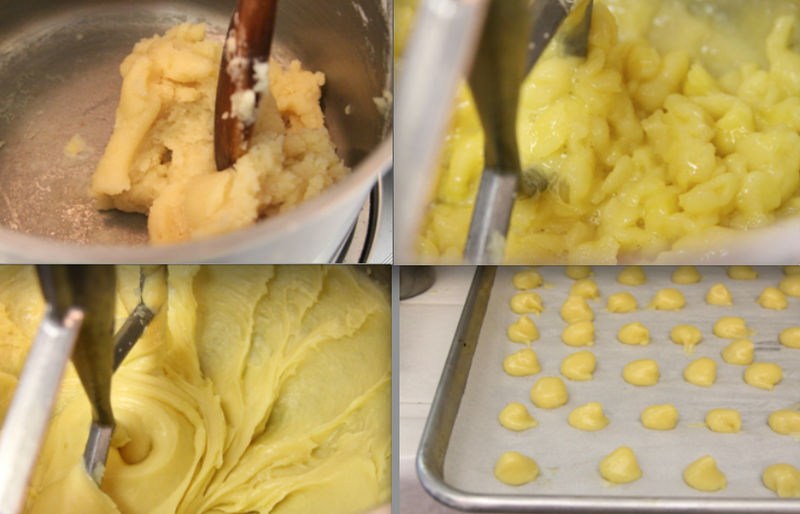 As the sugar cools and becomes taffy-like, use a fork to pull strings up and drape around your tower of pastry puffs. If at any time the sugar gets brittle or too hard to work with, just reheat and start again. It can be used over and over by reheating. Beautiful job! I love the idea of using the green tea in the pastry creme! And you did a fantastic job with the spun sugar, too!